We wait all year for the holidays. Colourful decorations and lights add whimsy to our everyday lives. The supermarket buzzes with the excitement of the New York Stock Exchange with masses fighting for a spot near the glass of the service counter, a clerk calling out #97…. #97? and a hand holding a little yellow ticket bouncing among the crowd Here! Over here! The plump Christmas tree is a most-welcome guest, filling the house with a fresh pine scent. But the best part of all is the beautiful table bursting with our favourite foods, surrounded by our favourite people. Then, it’s over in a snap and we have to wait a whole year again. Fortunately, most of us have enough leftover food to feed a family of bears and keep the holidays around for a few more days. But, turkey, gravy, stuffing have made their second appearance since Thanksgiving and you’re probably cranberried out by now. Ditch all the usual leftover recipes for something with a French accent. Creamy mushroom soup, Dijon mustard and fresh tarragon transform roasted turkey into a cozy, rustic casserole while you watch A Christmas Story for the 57th time with your sweetie. Shredded parmesan turns leftover stuffing into a crispy topping and the already-cooked meat cuts baking time in half. Dice turkey into bite-sized pieces and put into an ovenproof casserole dish. Clean and dice carrots and asparagus spears and add to the turkey. Add to the turkey-vegetables and mix well to coat. Top with leftover stuffing (my favourite recipe below), sprinkle shredded parmesan and cover with lid. 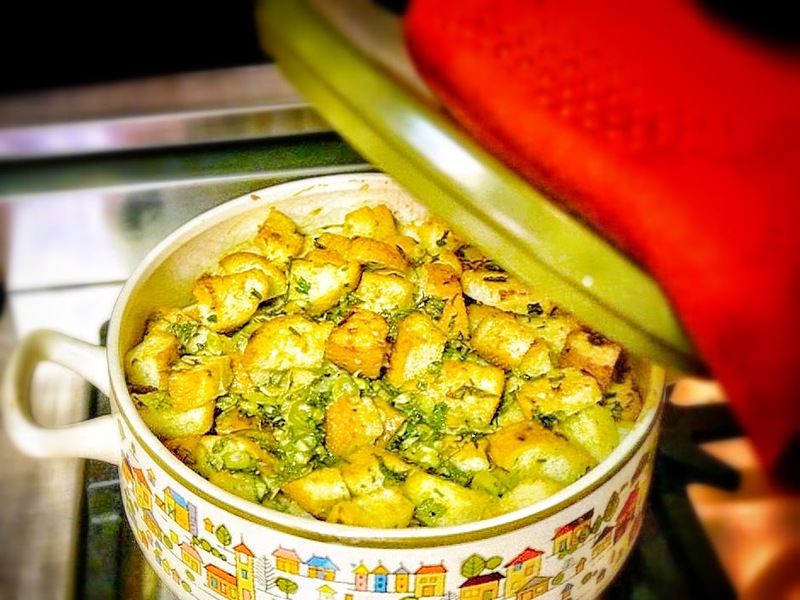 If your casserole dish does not have a lid, use foil to create a snug cover. Bake 45 minutes, just until everything is heated through, but the carrots still have a crunch. Serve with a simple salad and a glass of champagne! 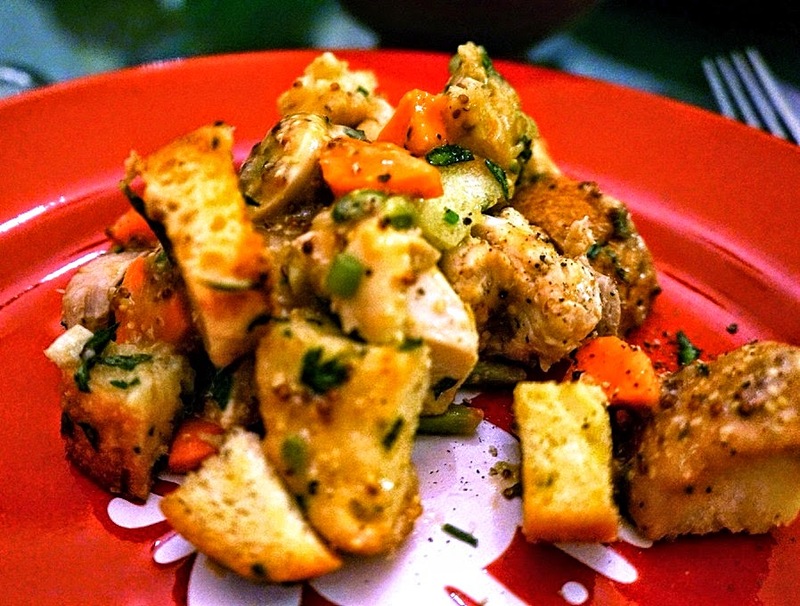 Cut bread into bite-size cubes and transfer to a large clean bowl. Wash and chop herbs and add to the bread. Give the garlic clove a good bashing with the back of a knife and mince. Add to the bowl along with a good drizzle of olive oil, salt & freshly cracked pepper. These flavours are likely typical in France, but a welcome change from our recent indulgences here in the States. Tarragon, baguette and Maille make this so special. 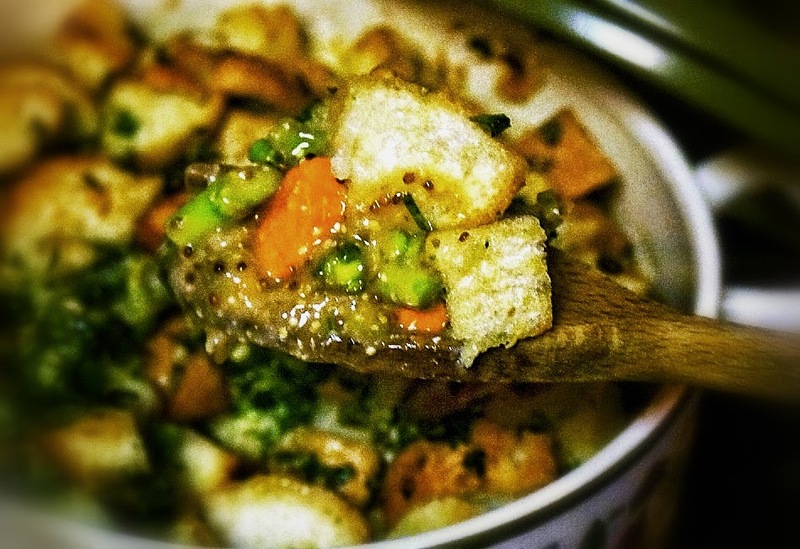 Make the holidays linger with this rustic dish and Christmas will be back before you know it. This looks delish – tarragon is one of my favorite herbs to use with poultry! And I love your casserole dish – such a fun design! Thanks, Carly. The tarragon & Maille make this very French! The pot is vintage Japanese, a lucky find. I love the colourful houses painted on the side. Looks delicious. I love this kind of a dish. And Colette, I am never tired of cranberries… or any fruit or vegetable for that matter. Hope the bread comes out. Cheers. Happy New Year! Perfect dish for a cold winters evening! Love homey dishes like this, so comforting! Thanks, Lori. I'm baking a loaf today. Happy 2014 to you, too! Hi, Nazneen. Yes, perfect for a cold night. Happy new year to you! Thanks for stopping by.